Stampin' Up ideas and supplies from Vicky at Crafting Clare's Paper Moments: Hang out the garlands - there's great news! Hang out the garlands - there's great news! What a great stamp set this is for celebrating any happy occasion, for males or females, young or old! I chose an energetic colour combination of Coastal Cabana, Pumpkin Pie, Daffodil Delight and Rich Razzleberry for this happy birthday card! Now what about that Stampin' Up news...? I'm delighted that I'll be able to offer you selected Stampin' Up products at slashed prices each week in April starting TODAY! Do you love framelits? Well how about £20.95 now only £15.71! What about embossing folders? Flower Garden, Framed Tulips and Needlepoint border £7.50 now only £5.63! There's more too - just click here to go to my online shop and follow the Weekly Deals picture. I always seem to spend a lot of time cooking during the holidays as the boys seem to have turned into locusts! Luckily I have an eager helper in the form of my youngest son although since puddings seem to be his main focus, I'm not sure how much help he is! Love the colours in this bright 'n breezy card, Vicky. One of my favourite quotes is "Life's short, eat dessert first", I'm sure your son's puddings would go very nicely for more than just dinner LOL !!! 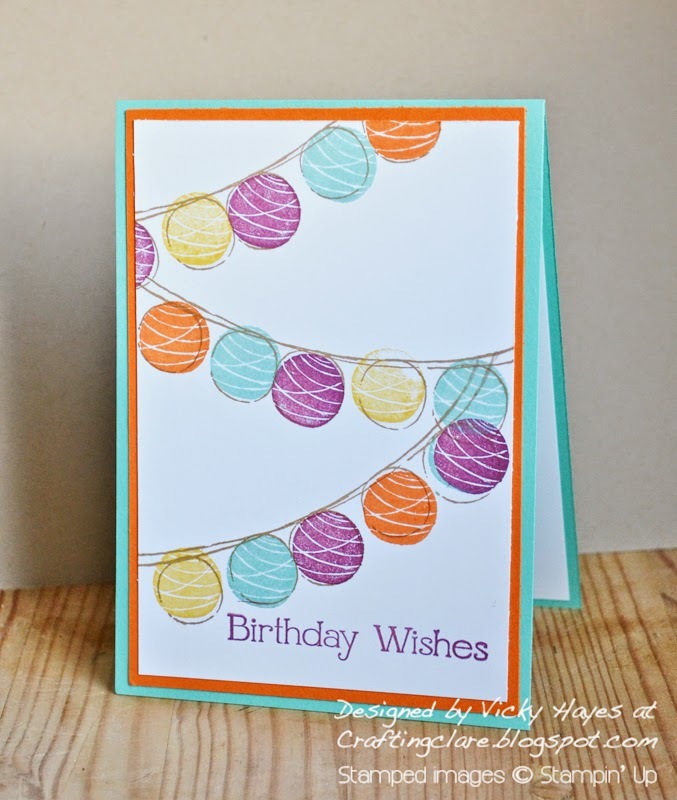 Wow - you are making some lovely cards with that garland 2-step set. Off to check out deals! Great card Vicky I love the sketchy look of the bunting:) sounds like a pudding fest in your house! Great colour combo here Vicky - and a great stamp set!